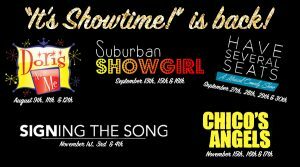 Colony Theatre in Burbank has announced a second season of It’s Showtime!, a five-show series featuring entertainment ranging from concerts to comedy and parody. The series is designed to provide something for arts lovers of all ages. First up is Doris and Me, a joyful celebration of the music, life, and career of Doris Day and one man’s quirky obsession with America’s sweetheart. In his multiple-year Eddon Award-winning and BroadwayWorld.com’s Critics Choice performance, Scott Dreier transports audiences and guides them on a nostalgic sentimental journey. If you’re a Doris Day fan, this is a must-see; if you have yet to be introduced to this timeless legend, you’ll be a devotee by the end of this uplifting, tuneful, funny, and loving musical tribute. Directed by Ovation Award-winner Richard Israel. Runs August 9, 11 and 12. Next is Suburban Showgirl. Palmer Davis stars in this hilarious and heartfelt tour-de-force about the life of the professional dancer Wendy Walker, who finds her perfectly choreographed life spinning out of control. Singing and dancing non-stop, Davis plays over 18 characters that will take audiences deep into the unpredictable journey of a dancer’s life. Suburban Showgirl is a dramatic musical comedy that will delight and inspire audiences of all ages. Runs September 13–16. In Have Several Seats, Carlie Craig (MADtv, First Impressions with Dana Carvey, MTV’s Todrick) performs original comedic songs, celebrity impressions, and musical parodies all woven together with her side-splitting stand-up. The show highlights the highs and lows of her first five years in Los Angeles — between working as a personal assistant, starring on a short-lived reboot of an iconic sketch show, all while supporting herself as a party princess, Carlie has endless stories to tell and you won’t want to miss a single one. Runs September 27–30. Through ASL (American Sign Language) paired with singing, William Martinez’s Signing the Song shares the true story of a boy who grew up in a deaf household with little exposure to TV, radio, or movies. Because of his incredible 8th grade music teacher and the love and support of his parents, he came out of his silent world and discovered his voice through music. ASL and song lyrics meld together into a beautiful unique art form. This solo show celebrates the incredible impact educators and parents have on each child’s life, regardless of their struggles. Music composed and arranged by David Bawiec. Runs November 1–4. Concluding the series will be Chico’s Angels, a live comedy production that parodies the 1976–1981 television series Charlie’s Angels. Three of LA’s favorite drag queens star in the title roles — Kay Sedia (Oscar Quintero), Chita Parol (Ray Garcia), and Frieda Laye (Danny Casillas). LA Weekly called the show, “a riotous comedy.” And TMZ noted that, “The shows have become a cult favorite and received rave reviews.” This special enhanced episode, Chico’s Angels 5-0 “Waikiki Chicas,” is one hurricane of a case! After Hula dancers have gone missing from Waikiki’s hottest night club The Hula Ho, the girls go undercover in grass skirts, coconut bikinis, and cha-cha pumps to solve the case. Runs November 15–18. Admission for all shows is $35 and tickets may be purchased online at www.colonytheatre.org or by phone at (866) 811-4111. The Colony Theatre is located at 555 N. Third Street (between Cyprus and Magnolia) in Burbank, 91502. Ample free onsite parking is available.